There’s always those quotes that bypass the Ego gate and strike a chord deep within what Jung might call your “Collective Unconscious,” and this was one of them for me. One reason this strikes me is that it seems to relate or come very close in a metaphysical way to the Physical Scientific Fact that all of us have wave functions that fill up not just the entire Universe but also the infinite number of Quantum Multi Verses, as well as all of time past and all of time future, forever and ever without end. That sounds Metaphysical, but it’s actually a Scientific fact. It almost feels like how they built the railroads in the 19th century, one group working from the West Coast inwards, the other from the East, and then they met in the middle. It seems like the more Science discovers or rather “uncovers” the more the images seen in the telescopes and the microscopes seem to resonate with the images of Metaphysics, Mythos, and what is coming out of the Collective Unconscious. The great barrier in the Metaphysical picture painted above is the Ego, which is symbolized by Dragons, serpents, and other creatures that are cutting off this natural flow of “Cosmic” energy. In the Fairy Tale and Myth, “Slaying the Dragon” is symbolic of “Slaying” your own “Ego” which by its very nature of seeing itself as separate from “Nature” and the rest of the World and Universe, destroys Spirit. For in this picture, “Spirit” like the bloom on a flower is the by product of Nature, something created by nature, not something separate or to be imposed on nature. Makes me start to think that the Wave Function is the equivalent of “Consciousness” as in the famous Vedic expression: Being> Consciousness> Bliss (Sat, Chith, Ananda in Sanskrit) So, the second of that Trinity. “Being” seems to be the initiator of a great track opening up. But what is “Being”? That seems to be the great mystery and key. 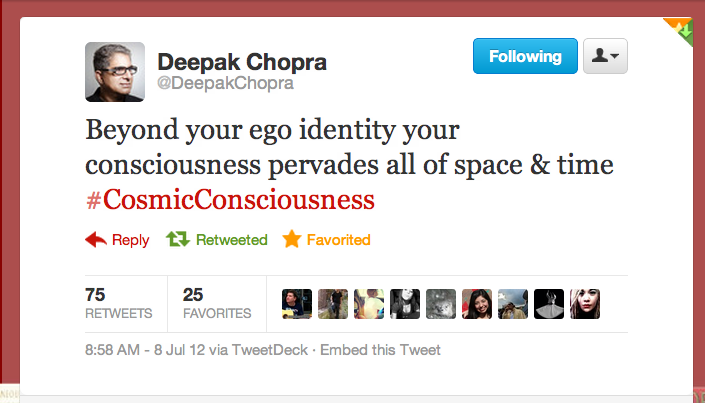 This entry was posted in Philosophy, Science and tagged Cosmic Consciousness, Deepak Chopra on July 8, 2012 by Stephen Pickering.